Croissant Cinnamon Rolls (or Swirls) are amazing (and I don’t use that word lightly). Don’t get me wrong, I still love the pillowy soft “regular” Cinnamon Rolls. But, with their layers and crisp exterior, these Croissant Cinnamon Rolls are a whole different animal. I have a lot of croissant dough in the freezer since I made multiple batches for last week’s How to Make Croissants – A Tutorial. Putting that post together I realized I hadn’t taken photos of all the steps I wanted to include, so I had to make another batch! So I thought, Why not make some of this dough into something with cinnamon? My first experiment turned out so deliciously that I just had to share it with you. And, in case you happen to subscribe to my six-teaspoons-a-day sugar limit, explained in my Sugar – Toxin or Treat? post, one of these rolls will just about take you to the limit. 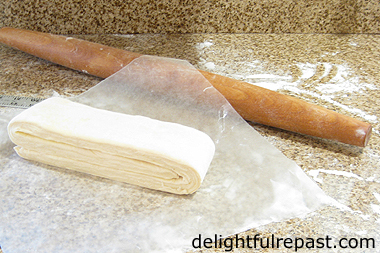 1 Transfer the frozen dough to the refrigerator to thaw overnight. 2 After the 9x4-inch (one-third batch) piece of dough has thawed overnight in the refrigerator, bring it out of the refrigerator 20 minutes before you want to start rolling it out. 3 Line a heavy-duty half sheet pan with parchment paper. In small bowl, whisk together sugar, cinnamon, vanilla extract and salt. 4 On lightly floured surface, roll the dough into a 16x10-inch rectangle about 1/4 inch (6 mm) thick. With a short end of dough in front of you, spread the sugar mixture evenly over the dough leaving 1 inch clear at the end farthest away from you and 1/2 inch clear at the sides. Starting with the short end closest to you, roll the dough tightly into a log. Pinch the dough along the seam to seal. 5 Place the log on a cutting board. With a very sharp knife (I use my Wusthof Classic Extra Wide 6-Inch Cook's Knife, my favorite knife in all the world), trim off the uneven ends (you'll have very little to trim if you make your rectangle of dough nice and even) and slice into 9 1-inch pieces. Place on parchment-lined half sheet pan at least 3 inches apart. 6 Set the baking sheet in the cold oven and place a pan of boiling water (just 3 or 4 cups) on the bottom of the oven. This will keep the rolls from drying out. Let rise until very puffy (they won't "double;" but if you gently poke one in the side with your finger, the dent should remain), about 2 to 3, even 3 1/2 hours. Be sure to take them out before you preheat the oven! OR If you have a half sheet pan with a lid and 4 little cups of some sort (these are 1.5 inch tall 2.5-ounce stainless steel sauce cups my mother got at a restaurant supply store decades ago), fill cups with boiling water and set them in the corners of the pan and put the lid on. Doesn't matter that the water cools off, it's just there to get some moisture, not heat, around the rising croissants. 7 Preheat oven to 450F/230C/Gas8. In small bowl, whisk together the egg wash. Brush the risen rolls with egg wash and then again just before baking. As soon as you put the pan in the oven, reduce heat to 400F/205C/Gas6. Bake for about 20 minutes, until deep golden brown. 8 Allow to cool for 10 minutes before glazing. Whisk together the glaze and drizzle over the warm, not hot, cinnamon rolls. Serve warm or room temperature. 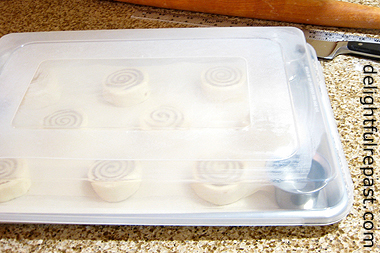 Note: To freeze baked cinnamon rolls, leave them unglazed, cool completely and wrap airtight. Then just unwrap and heat unthawed rolls at 375F/190C/Gas5 for 8 to 10 minutes; glaze. These rolls look incredibly delicious and beautiful. I have a feeling that you are a perfectionist because every single one is evenly and beautifully rolled. Takes one to know one, Angie! :D Yes, I'm afraid I am a little fussy about getting every item in a batch of something exactly alike! Ah, Jean, one of my favourite things to go with a cup of coffee. We call them Danish swirls, a type of Danish pastry. Thanks, Tony. I like that name, Swirls, and have added it to the first paragraph! Of course, I prefer mine with a cup of tea! Thanks, Ellen. Yes, we had a batch in the freezer, but finished off the last pair of them last night. So sad. Oh my goodness but that looks good! I don't know if I could tackle croissant dough, though. Sure you could, Pondside! With my step-by-step tutorial, I know you can! I house always smells so yummy when Cinnamon Rolls are baked! Your instructions are always so thorough! Thanks for sharing Jean! Thank you, Sully. I am duly honored to receive the 5 Cleavers Award. These are definitely the rolls for you. The warm "glurp" is exactly right and turns into yet another thing altogether on the bottom of the rolls--caramelized and perfect. Bernideen, thank you. 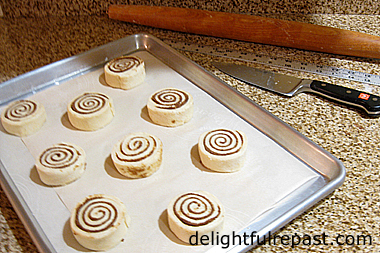 Cinnamon rolls DO fill the kitchen with wonderful aromas! WOW! These look incredible - I haven't been very successful in my healthy eating this January so don't feel bad at salivating at these! Thanks for sharing at #TriumphantTales. Jaki, thank you! And these actually ARE part of a healthy way of eating -- as long as you have just one and have it be the only sugar you have that day. I have just seen the tutorial. I will let you know if I give it a go. Honora, thank you. I so hope you will give it a go. I'll be eagerly awaiting your report! Thank you, Greg -- we think so, too! Mmmmm would l ever love one of your cinnamon buns, Jean!! They look ever so heavenly and with a cup of tea, they would be divine! Thank you, Kitty - yes, perfect with a cup of tea! Thanks, Mrs Shoes. I need to make another batch! A great use for croissant dough. It might be a bad time to admit that I'm not a big fan of cinnamon. There are plenty of alternatives to keep me happy, though. I can't understand why I haven't got a baking pan with a lid. That's such a useful idea. Yes, these are a lot of work, but so worth it! Some people make 'regular' cinnamon buns without doing the puff pastry version, but it really does make a difference. NICE! Phil, feel free to "admit" such things here any time - I won't take it personally! :D If you get one of these pans, you are going to love it. Thank you, Maristella. Of course, you'd like the rolls more on a pretty plate! Fran, thank you! And I agree, I'm a huge fan of the laminated dough! I am so envious of your leftover croissant dough! Your cinnamon buns look extraordinary!!! I'm sure they're wonderful. Probably irresistible. Once I start with sugar, it grabs me with both arms. They look amazing, Jean. Thanks, Judy. "Grabs me with both arms" is a great way to put it - I'm okay as long as I don't go over my limit of 6 teaspoons in a day. So if I eat one of these, and no other sugar, I'm good; but if I ate two, that would set off cravings. I've had tons of cinnamon rolls and have never thought of making the croissant version until now. What a neat idea! Thank you for the visit and kind comments. Blogging can be challenging to maintain when I'm working full-time, but I hope to keep it up as long as I can. Oh, you sneak! First you taunt us with croissants that look so delicious and like they will take forever to make. And now you up the ante with those to-die-for looking cinnamon rolls from the croissant dough. You're going to get us to make all of that, aren't you? What else are you making from it? C'mon. Bring it on! Ah, these look like delicious, and slightly decadent, comfort food. I could use some of that today! Thanks for the sugar reminder, Jean. Margie, thank you. And keep up the good work! Jeanie, too funny! :D And, yes, there is more to come, but I'll give it a rest for a while before I "bring it on!" Pauline, thank you. Some people probably wish I'd give the limited sugar thing a rest, but it really works for me! Jean, these look absolutely amazing!! A cup of coffee and one of those perfect cinnamon rolls . . . well, that would be a perfect treat! Cheryl, thank you so much! Make mine decaf! I've used pizza dough to make cinnamon rolls the next morning and they always turn out great. But no doubt these would be super tasty too! I'd probably leave off the icing and save the sugar for something else later in the day, like chocolate! Richard, that works - I always leave the icing off mine, but most people want icing on their cinnamon rolls. But you know me, I even leave the icing off the cupcakes I'll be eating! I so love cinnamon flavour, I cannot miss the chance to give them a try, thank you once again dearest Jean ! Dany dear, thank you. I hope you will try them soon. Have a lovely, not too chilly, weekend! You did it again, Jean! You topped off my favorite Croissants with my next favorite (but only saved for Thanksgiving and Christmas) cinnamon rolls. I can't wait to break my own rule of when I make them to try my hand at this perfect combo. Wow. You're are beautiful! Oh Sue, you are so sweet! I can't wait for you to try them! Be sure to tell me all about it. What delicious looking treats. Frankly, I wish I had some right now. I'm dying for a cup of coffee and they would be erfect along with them. Thanks, Marisa! I could go for one right now myself, but all gone! Oh my, Jean, you've done it again! Would my hubby ever go for these! Cinnamon rolls are his absolute favourite and made out of croissants would be such a treat. He will have his with the icing while I prefer mine without. Tea or coffee, doesn't matter. Both would go better with one of these. Enjoy your weekend and thank you for a great recipe. Sandi, thank you! Okay, we'll ice a few for the guys, and leave the rest uniced for ourselves! I love everything about this recipe! Cinnamon rolls are one of my favorite baked treats. Thank you, Balvinder! I hope you will make it soon! Cheryl, I don't know why, but caffeine in tea doesn't bother me a bit; but one cup of coffee totally wrecks me! Wow. I can hardly imagine how flaky and wonderful these are! Cinnamon rolls on crack! Mimi, thank you so much! Wow - a really great idea. I can't imagine how light and flaky this are -- yum! Thank you, Lauren! I can't wait to make more of them! Oh my, these have to be decadently delicious. What a way to start the day. Thank you, Karen -- wish I was starting the day with them today! OH my goodness! Those look amazing!! I have always wanted to make my own croissants but was way to intimidated to try. I'll have to go check out that recipe too! Pinned. Oh, thank you, Mother of 3! I hope you *will* give it a try with my step-by-step instructions. Bet you'll do just fine! Let me know. Yes, please! Do you ship, Jean! Wonderful, David! I can't wait to hear about it! Wish I could ship! I must have your rolls, they will be amazing! Thanks so much for sharing your post with us at Full Plate Thursday this week. Hope you have a great day and come back soon! Thank you for the recipe dear friend. It's been years since I haven't made cinnamon rolls and here is your recipe to go ahead and make it! I'm pinning it for when I come back from Florida. Thank you so much, Miz Helen! See you Thursday! Fabby, I hope you have a wonderful time in Florida! And do tell me how the rolls come out for you! These sound almost too good to be true, and they look fantastic too! I could easily eat one (or more!) now! Thank you, Tandy! I think you'll be glad you did! Thanks, ATIE! I think they're extra pretty because I took a moment to make sure the end was firmly attached so that they wouldn't bake up with "tails." Thank you, Nellie. Like my husband says when he sees me up to my elbows in dough, I sure know how to have fun! Wishing you a wonderful 2018. Oh, they look absolutely delicious Jean! Thanks for sharing with SYC. Jann, thank you. And thanks for hosting SYC. Nita, thanks. I hope you'll have fun making them AND eating them! Let me know how they turn out for you. Yum! 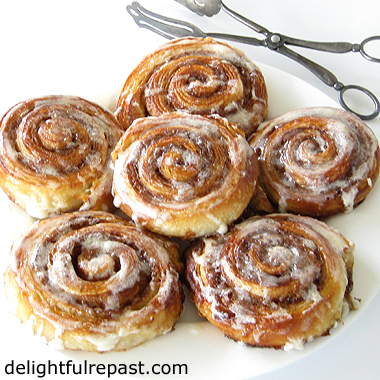 I love cinnamon rolls and this recipe is one of the best I've seen in a while, Jean! Can't wait to give this recipe a try! Thank you, Agness! (Nice to hear from you; I always remember you because you're the only person I've ever seen who spells Agness with two S's like one of my ancestors.) I can honestly say I've never had a cinnamon role anywhere that I like better! Oh wow these look amazing!!!!!! I love me a cinnamon roll anyday of the week! It must be very happy to taste sweet croissant rolls in cold winter. Thanks for visiting my blog. Thank you, RTC! Yes, the cold weather calls for a warm croissant and hot tea! Oh, wow! These looks SO GOOD! Amazing is exactly the word, actually. :-) Excellent recipe -- thanks. Thank you so much, John! I don't think you're one to just bandy that word (amazing) about! Well, along with the other 86 people who have commented so far...I am going to So Try This! I think I'll like them better than the regular ones because I'm a big fan of Morning Buns. Wondering if you've ever done a recipe for morning buns? Thanks, Sugar! I hope you'll like this recipe even more than morning buns. No, I haven't posted morning buns -- mostly because they're made in a muffin tin and I worry that they'd stick in my muffin tins like glue! These are baked on a parchment-lined baking sheet, so no worries. i love that you can freeze your croissant dough - and what a fabulous way to use it, Jean! 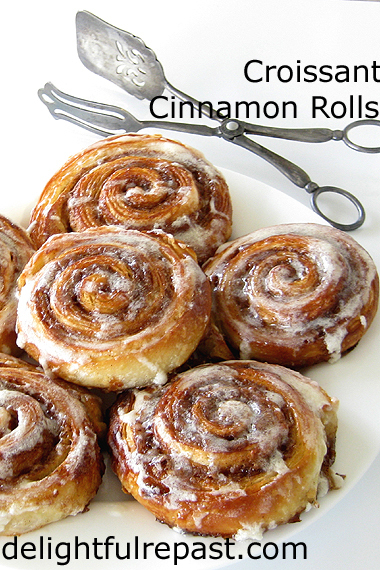 Your Cinnamon Croissant Rolls look absolutely delicious! Sharing. Thank you so much for being a part of the Hearth and Soul Link Party! Oh my, Jean, these looks amazing. I can't think of anything nicer for a winter's weekend breakfast. April, thank you so much. I had to try freezing it because I don't want to bake 27 croissants at a time, nor do I want to do all the work for a scaled down recipe. Was so glad to see that freezing works so well. Thank you, Karen. Yes, such a treat on a cold, wintry day! Amalia, thanks. Imagine serving these to houseguests for breakfast! Annette, that's wonderful! It won't be exactly the same because the puff pastry is not a yeast dough, but it will be very good! Do let me know how they turn out for you. And thank you for hosting the linkup, Dawn. Would have loved a cinnamon swirl with my tea this morning - must make another batch! Thank you, Menaka. And, of course, it's all organic! Thanks, SLM. And I know what you mean! But my freezer saves me -- I freeze individual portions and then *try* to forget they're there!